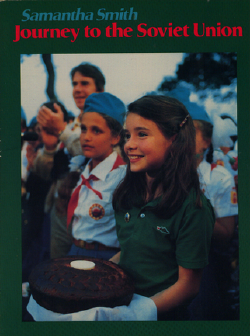 Samantha Reed Smith (June 29, 1972 – August 25, 1985) was an American schoolgirl from Manchester, Maine, who became known as "America's Youngest Ambassador" in the United States and the "Goodwill Ambassador" in the Soviet Union during her short lifetime. She became famous in these two nations and well-known around the world through the simple act of writing a letter to the leader of the Soviet Union, Yuri Andropov, during the Cold War. She received a reply from him which included a personal invitation to visit the Soviet Union. She accepted this invitation and spent two weeks there with her parents in the summer of 1983, a time in which few foreigners dared to enter that nation. Assisted by extensive media attention in both countries, she later participated in peacemaking activities in Japan, giving an address to the Children's Symposium in Kobe, in December 1983. It was during this symposium that she proposed the "International Granddaughter (or Grandson) Exchange." Samantha authored a book, Journey to the Soviet Union, in 1985, and co-starred in a television series, Lime Street, with the actor Robert Wagner. On August 25, 1985, Samantha died at the age of 13 in a plane crash in Maine. Her father died with her. Her death made headlines around he world, as millions mourned America's young peace activist. Both Mikhail Gorbachev and Ronald Reagan, leaders of the two most powerful nations in the world at that time, offered official condolences. Samantha Reed Smith was born in Houlton, Maine, and lived there with her parents, Arthur and Jane. She enjoyed field hockey, roller skating, reading, and science, and played on her school's softball team. At the age of five, Samantha wrote a letter of admiration to Queen Elizabeth II. In 1980, when Smith had just finished second grade, her family moved to Manchester, where she attended Manchester Elementary School. Her father taught literature and writing at the University of Maine at Augusta, and her mother worked as a social worker with the Maine Department of Human Services in Augusta. Soviet leader Leonid Brezhnev's death occurred November 12, 1982. Two days later, Yuri Andropov was elected General Secretary of the Central Committee of the Communist Party of the Soviet Union (CPSU), being the first former head of the KGB (Russian-language abbreviation for "Committee for State Security") to become General Secretary. His appointment was received in the West with apprehension, in view of his roles in the KGB as well as in Hungary. Andropov had been Soviet Ambassador to Hungary during the Soviet invasion of the 1956 Hungarian Revolution and had been responsible in part for the decision to invade. During his short tenure (15 months), which was marked by continually failing health, he achieved little in the way of foreign policy. The war continued in Afghanistan and his rule was marked by deterioration of relations with the United States. While he launched a series of proposals that included a reduction of intermediate-range nuclear missiles in Europe and a summit with U.S. President Ronald Reagan, these proposals fell on deaf ears in the Reagan and Thatcher administrations. Cold War tensions were exacerbated by the downing of a civilian jet liner, Korean Air Flight KAL-007, that had strayed over the USSR on September 1, 1983, by Soviet fighters, and U.S. deployment of Pershing missiles in Western Europe in response to the Soviet SS-20 missiles. Soviet-U.S. arms control talks on intermediate-range nuclear weapons in Europe were suspended by the Soviet Union in November 1983. America's Response to Andropov: Immediately following Andropov's election as the Soviet leader, the leading American newspapers and magazines had his picture on their covers and lead articles dedicated to him with rather negative views on his assumption of power and expectations of new threats to the world. During this period, massive anti-nuclear protests were taking place in Europe and North America; much was made of the upcoming ABC nuclear war television film, The Day After, which was scheduled to be aired later that month. President Reagan had also discarded the concept of détente, and had moved to deploy cruise missiles and the Pershing II missile in Europe. All this contributed to international tension. It was a Time Magazine article in a November 1982 issue that caught Samantha's eyes. "If people are so afraid of him," she asked her mother, "why doesn't someone write a letter asking whether he wants to have a war or not?" "Why don't you?" her mother replied. One of Andropov's most notable acts during his short time as Soviet leader occurred soon after he took office. This was his response to the letter from 10 year old Samantha, in which he assured her of his desire for peace and invited her to visit the Soviet Union. Soviet people well know what a terrible thing war is. Forty-two years ago, Nazi Germany, which strove for supremacy over the whole world, attacked our country, burned and destroyed many thousands of our towns and villages, killed millions of Soviet men, women, and children. It seems to me that this is a sufficient answer to your second question: "Why do you want to wage war against the whole world or at least the United States?" We want nothing of the kind. No one in our country—neither workers, peasants, writers nor doctors, neither grown-ups nor children, nor members of the government—want either a big or "little" war. I invite you, if your parents will let you, to come to our country, the best time being this summer. You will find out about our country, meet with your contemporaries, visit an international children's camp—"Artek"—on the sea. And see for yourself: In the Soviet Union, everyone is for peace and friendship among peoples. A media circus ensued, with Samantha being interviewed by Ted Koppel and Johnny Carson, among others, and with nightly reports by the major American networks. On July 7, 1983, Smith flew to Moscow with her parents, spending two weeks as Andropov's guest. During this trip, she visited Moscow and Leningrad, and spent some time in Artek, the main Soviet pioneer camp in the town of Gurzuf on the Crimea peninsula. Although Andropov, who was already seriously ill, did not meet her, they spoke by telephone. Samantha wrote in her 1985 book, Journey to the Soviet Union, that in Leningrad she and her parents were amazed by the friendliness of the people and by the gifts many people made them. Speaking at a Moscow press conference, she declared that the Russians were "just like us." In Artek, she chose to stay with the Soviet children rather than take separate accommodations offered to her. For ease of communication, teachers and children with fluent English were chosen to live in the building where she was lodged. Staying in a dormitory with nine other girls, Smith spent her time swimming, talking, and learning Russian songs and dances. She made many friends there, including Natasha Kashirina from Leningrad, who spoke English fluently. Media followed her every step—photographs and articles about her were published by the main Soviet newspapers and magazines both during and after her trip. She became widely known to Soviet citizens and was well regarded by many of them. When Smith returned to the U.S. on July 22, 1983, her arrival was celebrated by the people of Maine and her popularity continued to grow in her native country. She became a political and peace activist, hosting a children's special in 1984, for Disney about politics, where Smith interviewed several candidates for the 1984 presidential election, including George McGovern and Jesse Jackson. Samantha went to Japan with her mother, where she met with Yasuhiro Nakasone, that nation's Prime Minister, and attended the Children's International Symposium in Kobe. In her speech at this symposium she suggested that Soviet and American leaders exchange granddaughters for two weeks every year (the "International Granddaughter Exchange"), arguing that a president "wouldn't want to send a bomb to a country his granddaughter would be visiting." Samantha's trip inspired other exchanges of child goodwill ambassadors, including a visit by Soviet child Katya Lycheva to the United States. In 1985, Samantha Smith wrote a book titled, Journey to the Soviet Union, and took on an acting role, co-starring with Robert Wagner in a television series called Lime Street. On a return flight from filming a segment for Lime Street in the summer of 1985, Smith's plane missed the runway of the Lewiston-Auburn Regional Airport in Maine by 200 yards and crashed, killing all aboard (six passengers and two crew), including Smith and her father. Much speculation regarding the cause of the accident circulated afterwards. An investigation was undertaken in the U.S. and the official report, which did not support any conspiracy theories, was made public. As stated in the report, the accident occurred at about 22:05 Eastern Daylight Time (10:05 p.m.), the ground impact point located one mile south-west of the airport. The report goes on to say, "The relatively steep flight path angle and the aircraft's attitude (the orientation of the aircraft relative to the horizon, direction of motion etc.) and speed of the airplane at ground impact precluded the occupants from surviving the accident." The main point of the report was that it was a dark and rainy night, the pilots were inexperienced, and an accidental, but not uncommon and not usually critical, ground radar failure occurred. Samantha Smith was mourned by about one thousand people at her funeral in Augusta, Maine, including Vladimir Kulagin of the Soviet Embassy in Washington, who read a personal message of condolence from Mikhail Gorbachev. The Soviet Union issued a commemorative stamp with her likeness. A diamond, a cultivar of tulips and of dahlias, an ocean liner, and a mountain were named in Smith's honor, and a monument to her was built in Moscow. "Samantha Smith Alley" in Artek was named after her in 1986. When Soviet astronomer Lyudmila Ivanovna Chernykh discovered asteroid 3147, she named it "3147 Samantha." Samantha's mother, Jane Smith, founded the Samantha Smith Foundation in October 1985, which fostered student exchanges between the United States and the Soviet Union (it became dormant in 1995). The first Monday in June of each year is designated as "Samantha Smith Day" by the law of Maine. There is a statue of Samantha near the Maine State Museum in Augusta, which portrays her releasing a dove, while a bear cub is resting at her feet. The bear cub represents both Maine and Russia. A Washington State elementary school was also named after Smith. At the University of Maine, an apartment-style dorm is named after her. After the collapse of the Soviet Union in 1991, the extensive coverage by the Russian media of all events related to Samantha Smith stopped. The monument built to her in Moscow was stolen by metal thieves in 2003. However, some interviews with her mother, Jane Smith, were published in Russian newspapers in the early 2000s and many people in Russia still remember her fondly. In 2003, Valentin Vaulin, a retiree from Voronezh, built a monument to her without any government support. In 1985, the Danish composer Per Nørgård wrote the viola concerto, Remembering Child, in memory of Smith. ↑ Samantha Smith, Look Around and See Only Friends. Retrieved February 15, 2007. 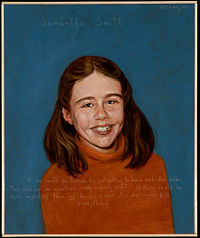 ↑ Samantha Smith info, Samantha Reed Smith (June 29, 1972-August 25, 1985). Retrieved February 15, 2007. ↑ Chronicle 1980s, Camp Artek. Retrieved February 15, 2007. ↑ Voronezhsky Telegraph, Voronezh Retiree Built A Monument to Samantha Smith. Retrieved February 15, 2007. Samantha Smith Center. Samantha Smith Foundation Newsletter. Hallowell, ME: The Foundation, 1994. Koppel, Ted, 12/23/04, Samantha Smith (1983), ABC News Nightline. Russian Language Article, "Three years Of Samanty Smith", Artekovskiy press- survey. Aircraft Accident Report, Aviation Safety Network. Anne Frank and Samantha Smith Postage Stamps, Citizens' Stamp Advisory Committee. This page was last modified on 12 August 2015, at 18:44.